Bump Steer is when your wheels steer themselves without input from the steering wheel. The undesirable steering is caused by bumps in the track interacting with improper length or angle of your suspension and steering linkages. Most car builders design their cars so that the effects of bump steer are minimal. However, you must still take care to bolt on your suspension carefully so as not to create unwanted bump steer. Make sure that you are always using the correct components for a particular car. Bump steer must be designed into the car and cannot be adjusted out if improper parts are used or if pivot points are moved without considering bump steer design principles. In order to accomplish zero bump the tie rod must fall between an imaginary line that runs from the upper ball joint through the lower ball joint and an imaginary line that runs through the upper a-arm pivot and the lower control arm pivot. 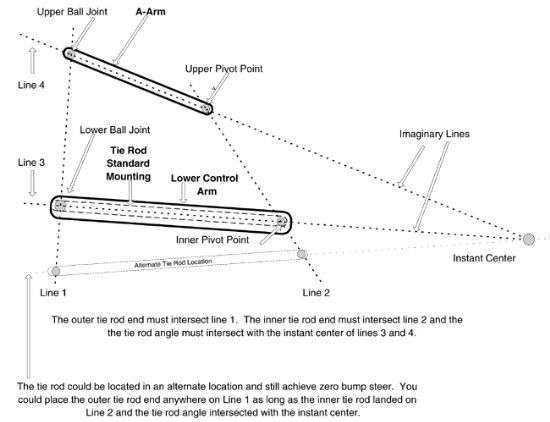 In addition, the centerline of the tie rod must intersect with the instant center created by the upper a-arm and the lower control arm (See diagram below). The instant center is an imaginary point that is created by drawing a line from the upper a-arm ball joint through the a-arm pivot where it is intersected by an imaginary line that extends from the lower ball joint through the inner control arm pivot. Where the two imaginary lines intersect is the instant center. Sounds complicated? Really it is very simple. To achieve zero bump the front end must be designed correctly. The tie rod must travel on the same arc as the suspension when the car goes through travel. Simply matching lengths and arcs to prevent any unwanted steering of the front tires. To exaggerate, if the tie rod were only 10" long and the suspension were 20" long then when the suspension traveled the tie rod angle would shorten much quicker than the suspension arc. In this scenario the tie rod would shorten much quicker through travel than the suspension and the car would toe in drastically over bumps. The shorter arc of the tie rod would pull on the spindle and toe it in through travel. When designing a car, if the centerline of the outer tie rod lines up with the centerline of the lower ball joint, and the inter tie rod lines up with the lower pivot point then the length and angle of the tie rod and suspension will be the same resulting in zero bump. Most car builders design their cars in this fashion. Your front suspension must be complete and set for racetrack conditions before you can measure the bump steer. 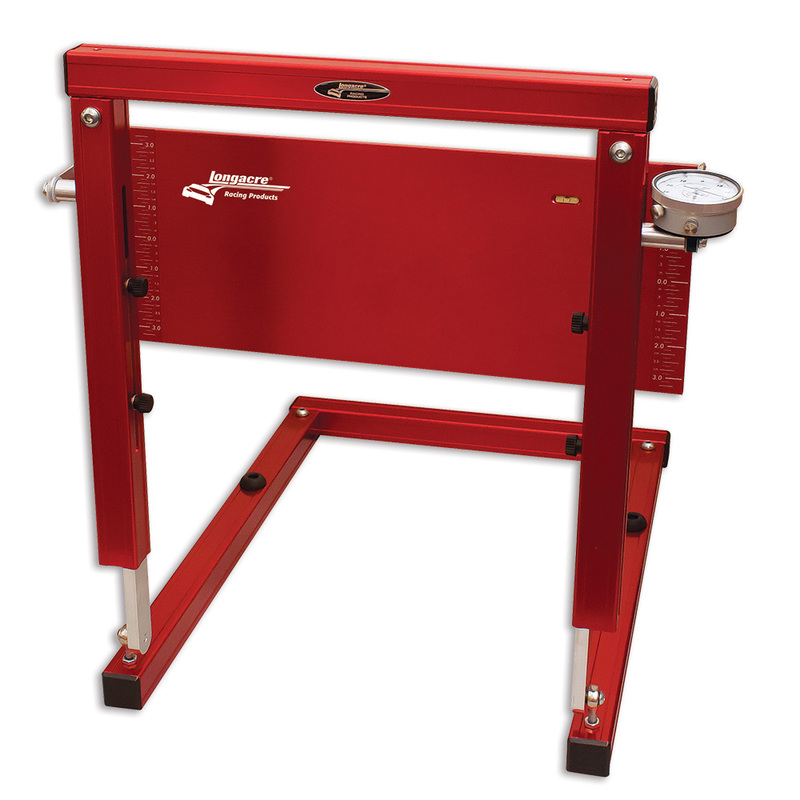 All components must be tight and in proper position and you will need a quality bump steer gauge. Set the car at ride height. Use the proper size tires and air pressures. Toe in must be set. Tie rod lengths must be set. Steering should be centered (tie rod ends centered on inner pivot points lower ball joints). Steering must be locked down. 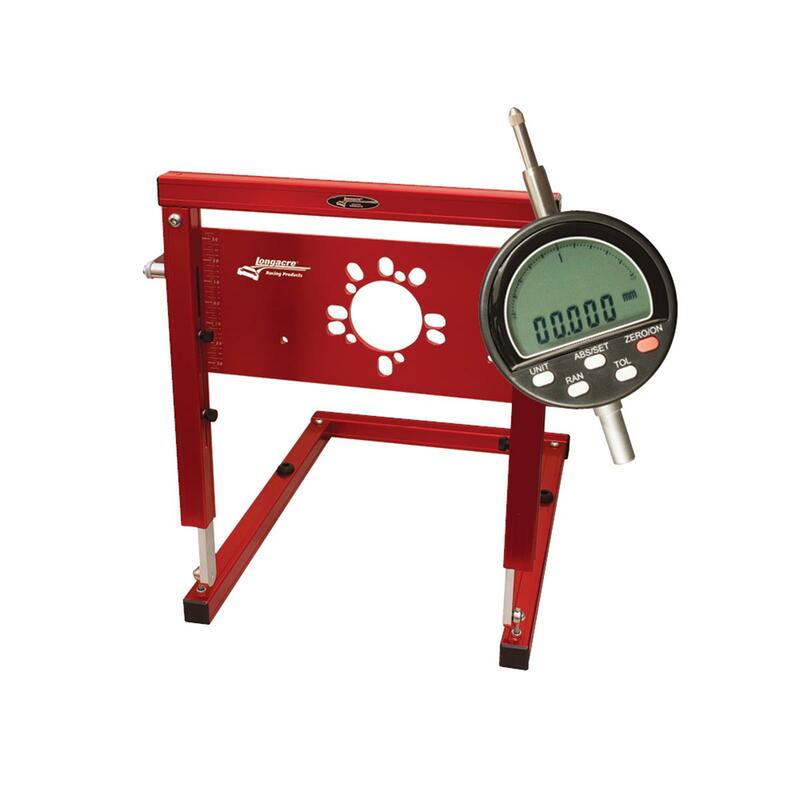 Measure from the ground to the lower ball joint or other reliable reference point. Write the number down. Remove springs and disconnect the sway bar. Return the suspension to the proper height by using your reference number to the ground. Obtain a supply of bump steer shims. Bolt on the bump steer plate to the hub. Level the plate and note where the dial indicator is on the bump steer plate so that you can quickly return to the correct ride height. Jack the suspension through 2"-3" of both compression and rebound travel and write down your results. 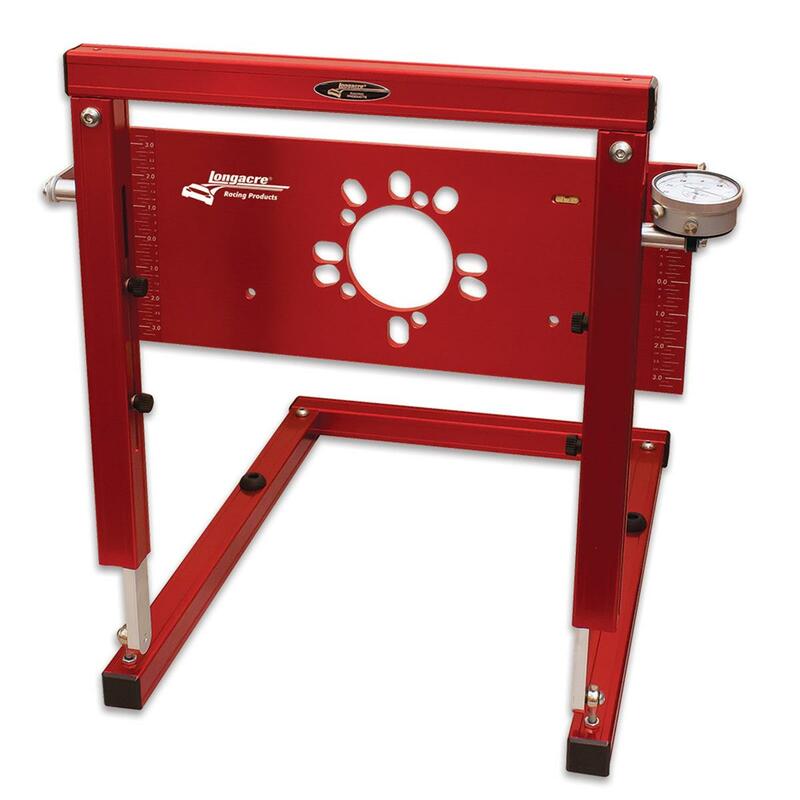 Now that you have measured your bump steer you will need to adjust, shim or relocate the suspension components to get the exact reading that you desire. Below are some tips that will quickly guide you through the corrective process for cars with front steer style suspension. Symptom 1. Toes out in compression and in on rebound all in one direction. Cure 1. Decrease shim on outer tie rod or lower the inner tie rod. Symptom 2. Toes in on compression and out in rebound all in one direction. Cure 2. More shim at outer tie rod or raise the inner tie rod. Symptom 3. Always toes in both compression and rebound. Cure 3. Lengthen the tie rod as it is too short. Symptom 4. Always toes out on compression and rebound. Cure 4. Shorten tie rod as it is too long. Symptom 5. Toes out on compression, then in on rebound and then starts back towards out with more rebound travel. Cure 5. Less shim at outer tie rod and shorten tie rod. Symptom 6. Toes in on compression, then moves out on rebound and then starts back towards in with more rebound travel. Cure 6. More shim at outer tie rod and lengthen tie rod. Selecting a good bump steer gauge makes the process easier. I like the bump steer gauges that utilize only one dial indicator. One dial indicator bump gauges do the math for you and you avoid having to watch two dial indicators move at the same time. Sometimes when the bump is way out of adjustment it takes two people to watch both of the indicators. The one indicator design is much easier to use. When you set up your bump steer gauge with the car at the proper height set the dial indicator at the center of the bump steer plate and be sure that the indicator is set in the middle of its range. You want to avoid running out of indicator travel. Once the indicator is set simply jack the suspension through 2"-3" of compression. Stop at each inch and record your reading. Repeat the process through rebound and record those numbers at each 1-inch interval. If the front of the bump steer plate is moving towards the engine then you have a bump in condition. If the front of the plate moves away from the engine then you have bump out. The dial indicator will see small amounts so watch it carefully and note your results. E. How Much Bump Steer? Ideally you should run as little bump steer as possible. Most of the tracks we see today are old and bumpy. Bump steer on these rough surfaces causes the car to be unpredictable. Some bump out can make the car more stable on corner entry. Bump in is almost always undesirable. Some people use small amounts of bump out to create entry stability and an Ackerman type effect in the center of the turn where as the bump setting causes the LF to turn a bit farther than the RF as the RF compresses and the LF extends. My recommendation is to run .005 to .015 thousands of bump out but never allow the tires to bump in. If you want Ackerman in the center of the turn then add Ackerman while maintaining proper bump. If you use bump to obtain some Ackerman effect the car will be unsettled as it goes over each bump, which will break the contact patch from the racing surface. If the design of your car does not allow for such precise bump adjustments then more bump out is better than any bump in. However, strive to get the best bump numbers even it if means replacing parts. Excessive bump over .050 can slow your car down.